I was asked by someone about "the story behind Lupin III" on Tuesday, and never got to answer as I was distracted by other things. Most of the information can be found on the intarwebs, so I'll cover things fairly simply. Lupin III started as a manga, first published in 1967, by Kazuhiko Kato under the pen name of "Monkey Punch", involving the adventures of the grandson of Arsene Lupin, gentleman thief, originally created in a series of novels by French author Maurice Leblanc. As Monkey Punch did not seek permission to use the Lupin name from the Leblanc estate, much of the early western releases of Lupin III had his name changed to "Wolf". Since Leblanc's works became public domain in the early 90's, this has not been a problem. The style and plots of the anime bear more in common with the 1960's Roger Moore tv series version of The Saint than they do with Leblanc's novels: gentleman thief stealing seemingly unstealable things whilst being chased by determined yet often incompetent police inspectors, becoming involved in the criminal activities of less-than gentlemanly crooks and saving attractive damsels in distress. For Moore, it wasn't such a difficult transition from the role of Simon Templar to that of James Bond. The series has only five recurring characters (though there are others that have made cameo appearances throughout the series): Arsene Lupin III, himself; Daisuke Jigen, his grumpy, gun toting sidekick; Goemon Ishikawa XIII, the latest in a long line of renegade samurai; Fujiko Mine, the amoral female thief and Lupin's uncatchable love-interest; and Inspector Koichi Zenigata, the blustering Interpol officer, who chases Lupin and his gang around the world in a never-ending quest to "bring them to justice". Cheese Ratings for what I've seen. 1969: Lupin III Pilot Film. 15 minutes long, acted as a test run to see if a Lupin III series was viable. 1971: Lupin III TV Series 1. 23 episodes. Cheese Rating: Roquefort. 1974: Strange Psychokinetic Strategy. Live action Lupin film (successfully forgotten by just about everyone). 1977: Shin Lupin III (TV Series 2). 155 episodes over 4 seasons (77-80). The two Miyazaki-directed episodes of this series were played at AJAS. 1978: The Mystery of Mamo. The first Lupin animated film. Has the record for being dubbed into English more than any other anime (4 times). Cheese Rating: Limberger. 1979: The Castle of Cagliostro. The most famous of all the Lupin films, directed by Hayao Miyazaki. One of the first things played at AJAS. Cheese Rating: Wensleydale. 1984: Lupin III TV Series 3. 50 episodes. 1985: Legend of the Gold of Babylon. Theatrical Film. Never played at AJAS, even though I tried.... Yes, it is kinda bad. Cheese Rating: Piccante Gorgonzola. 1987: The Fuma Conspiracy. The first Lupin III OAV. Did not use the original cast of seiyuu for the regular cast. Played at AJAS in 1995. Cheese Rating: Cheddar. 1989: Goodbye Lady Liberty. The first Lupin III TV Special. Cheese Rating: Stilton. 1991: Napoleon's Dictionary. TV Special. Cheese Rating: Camembert. 1992: From Russia With Love. TV Special. Baaaaaaaaad. Cheese Rating: Limberger. 1993: Dark Order of Assassination, played at AJAS in 1997. TV Special. Cheese Rating: Dolce Gorgonzola. 1994: Dragon of Doom. TV Special. Cheese Rating: Stilton. 1995: Farewell to Nostradamus, theatrical film. Cheese Rating: Brie. And The Pursuit of Harimao's Treasure, TV Special. 1996: Dead Or Alive, theatrical Film. Cheese Rating: Camembert. And The Secret of Twilight Gemini, TV Special. A damaged VHS tape stopped us playing this at AJAS, one of the better of the tv specials. Cheese Rating: Jarlsberg. 1997: Walther P38. TV Special. 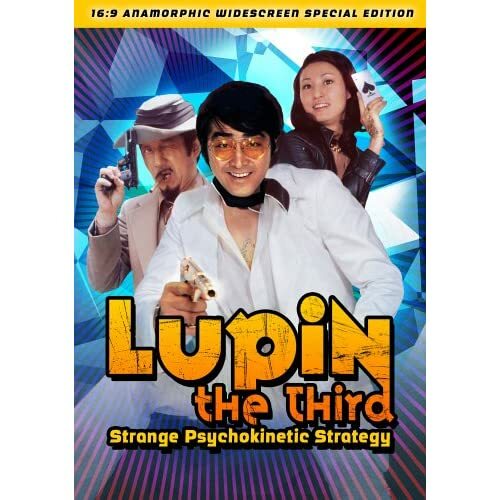 The least funny of all the Lupin productions. Cheese Rating: Parmagiano Reggiano. 1998: Tokyo Crisis. TV Special. Cheese Rating: Roquefort. 1999: Fujiko's Unlucky Days. TV Special. Cheese Rating: Stilton. 2000: $1 Money Wars. TV Special. 2001: Alcatraz Connection. TV Special. 2002: Return of Pycal, an OAV. Cheese Rating: Stilton. And Episode 0: First Contact, a TV Special meant to act as an origin story for Lupin, Zenigata and the rest of the gang. Played at AJAS a couple of years ago. Cheese Rating: Stilton. 2003: Operation: Return the Treasure. TV Special. 2004: Stolen Lupin. TV Special. 2005: Angel Tactics. TV Special. What we played on Tuesday. Cheese Rating: Stilton. 2006: Seven Days Rhapsody. TV Special. 2007: The Elusive Fog. TV Special. 2008: Green vs Red. OAV. Lupin III has a tendency to swim in and out of fashion. A version of the Lupin III theme was on the Japanese top 10 charts in 2006. It is one of the few animes that could be said to have a following outside of the otaku world in its native country, alongside other late 60's/70's favourites like Space Cruiser Yamato, Gatchaman, Cutey Honey, Yatterman, GeGeGe no Kitaro, Doraemon, Sazae-san and Captain Harlock. Mappy wrote: 1974: Strange Psychokinetic Strategy. Live action Lupin film (successfully forgotten by just about everyone). Mappy wrote: I am afraid. Mappy being afraid - usually a good indicator to take a 180 and leg it like Cathy Freeman 2000 styles. It doesn't look too bad to me. I have it now, Bwah ha ha ha!